As interest in electric vehicles continues to keep the automotive industry charged, the nation is strategizing how to best integrate plug-in vehicles with its electrical grid and highways. Now, with funding from the U.S. Department of Transportation for the creation of the first transportation center with a focus on electric vehicles, the University of Central Florida will help chart that course in Florida. 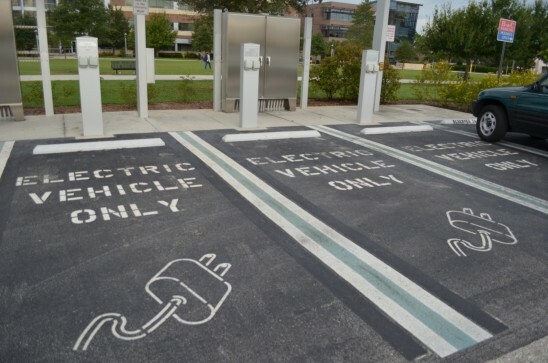 The Electric Vehicle Transportation Center operated by UCF’s Florida Solar Energy Center in Cocoa is a newly funded, four-year, $9 million research effort to help develop the nation’s electric-vehicle transportation network. Research conducted by the center will help transportation planners prepare our nation’s highways for the influx of plug-in electric vehicles (PEV), while developing “smart grid” applications that will strengthen the ability of our electric system to accommodate the power demands of electric vehicles. PEVs need a reliable, predictable network of charging stations to allow them to travel long distances without the fear of “running out of fuel.” Workplace charging, community charging, and highway fast-charging systems are in development. A new PEV transportation network designed in conjunction with the modernization of our electric grid system will result in a sustainable highway and energy network. Amen, Jack. Are you the only voice of reason on the campus? $0.99 per gallon? In the 1970's it was $0.24 per gallon and it could be again if we would recognize our own rich resources. Jimmy Carter and his administration created the illusion of the "energy crisis" and succeeding generations have been raised to believe that it is a fact. We are told that electricity is so much better. And how do we make electricity? Dam the rivers? The environmentalists are against that. Burn coal? The environmentalists are against that. Create nuclear power? The environmentalists are against that. Even horses create a bit of an environmental "hazard." So tell me again how this electricity is going to help us "save the planet?" Oh, that's right. Saving the planet is not the agenda. Controlling the mobility of the people is. Drilling and refineries create good paying jobs. We are being robbed. Where do you get your information that "As interest in electric vehicles continues to keep the automotive industry charged . . ." This electric car stuff is a boondoggle. If it wasn't for the $7,500 taxpayer subsidy to buy the Volt, even less people would buy it. Americans to not like and do not buy electric cars. This is the federal government trying to make a market where there is none. You should do further research on the hundreds of thousands of dollars lost on charging stations that are now ghost towns because nobody is using them. You should use this money for other things where the utility will be higher instead of pursuing another liberal agenda item.